Remember when the official narrative was that the tarmac meeting between Attorney General Loretta Lynch and Bill Clinton was a chance meeting where they spent 30 minutes talking about golf and grandchildren? Yeah, that meeting. Maybe not so much about the grandkids after all as the FBI has turned over some 400+ emails to Judicial Watch based on their Freedom of Information Act requests. The video below also reveals that one of the discoveries in these emails reveals that a "Team Mueller" press agent was in some way involved in handling press for the FBI in the Lynch/Clinton tarmac meeting. -W.E. Who is running the store at the FBI!? 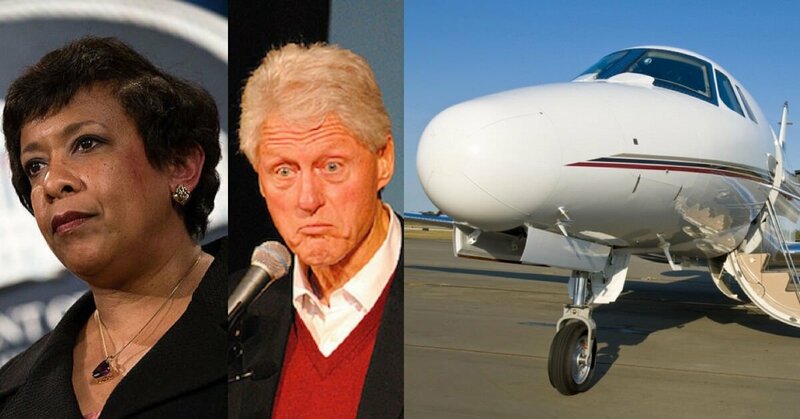 First the FBI told us it had no documents related to the infamous tarmac meeting between former Attorney General Loretta Lynch and former President Bill Clinton. But now the FBI just told us that the FBI located 30 pages of documents related to the June 27, 2016, meeting, and it proposes that it produce non-exempt material no later than November 30, 2017. On June 27, 2016, Attorney General Loretta Lynch met privately with former President Bill Clinton on board a parked private plane at Sky Harbor International Airport in Phoenix, Arizona. The meeting occurred during the then-ongoing investigation of Mrs. Clinton’s email server, and mere hours before the Benghazi report was released publicly involving both Mrs. Clinton and the Obama administration. We filed a request on June 30 that the U.S. Department of Justice Office of the Inspector General investigate that meeting. The FBI is out of control. It is stunning that the FBI “found” these Clinton-Lynch tarmac records only after we caught the agency hiding them in another lawsuit. We will continue to press for answers about the FBI’s document games in court. In the meantime, the FBI should stop the stonewall and release these new records immediately. This case has also forced the FBI to release to the public the FBI’s Clinton investigative file, although more than half of the records remain withheld. The FBI has also told us that it anticipates completing the processing of these materials by July 2018. Andrew McCabe was in charge of the FBI’s Washington, DC, field office, which provided personnel resources to the Clinton email probe. Judicial Watch has several lawsuits about this McCabe/FBI/Clinton scandal. We’ll be sure to report back to you when we get the new documents.